We picked the favas from our garden and made ricotta from the milk of Holly, Sunset's cow (she lives on a farm south of our office). Store-bought ricotta and crackers work fine in this recipe—but if you want to make your own, as we did, you'll learn how in our book. Shell fava beans (you will have about 2 cups). Boil beans in salted water 2 minutes, then rinse with cold water until cool. Peel tough skin from each bean by tearing it open at its round end and popping out the bean. 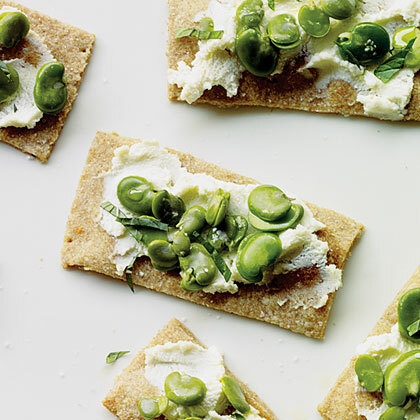 Spread crackers with a thin layer of ricotta and top with favas and mint. Sprinkle with salt and drizzle with oil. Make ahead: Peeled fava beans, up to 1 day, covered and chilled. Note: Nutritional analysis is per cracker (if using homemade).